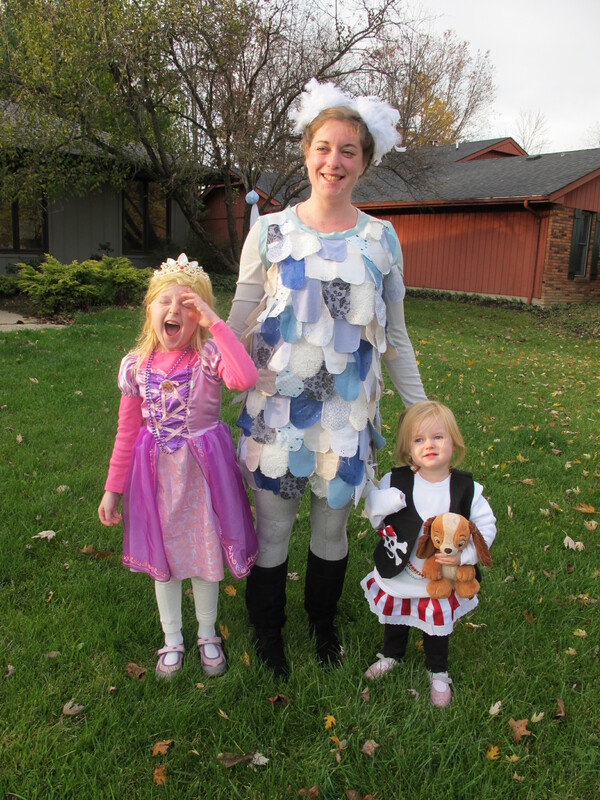 The costumes were pretty simple to make. The base of the dress is a white pillow case, cut out a hole for your head and two for your arms and add rectangular scraps of fabric with the bottom edges rounded off. 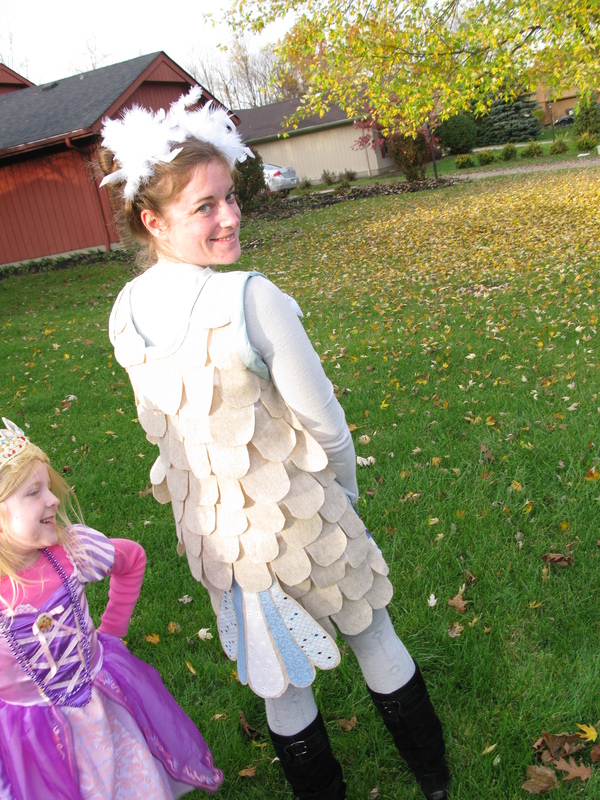 We hot glued everything, because it’s so much easier than sewing-plus I think I’m addicted to hot gluing. I use it whenever possible, even if it doesn’t always make sense. The original idea on A Beautiful Mess only had the front of the pillow case covered. When we admired our dresses in the mirror we decided that the back needed something too. From the front we looked fantastic, but from the back it just looked like we were wearing pillow cases. 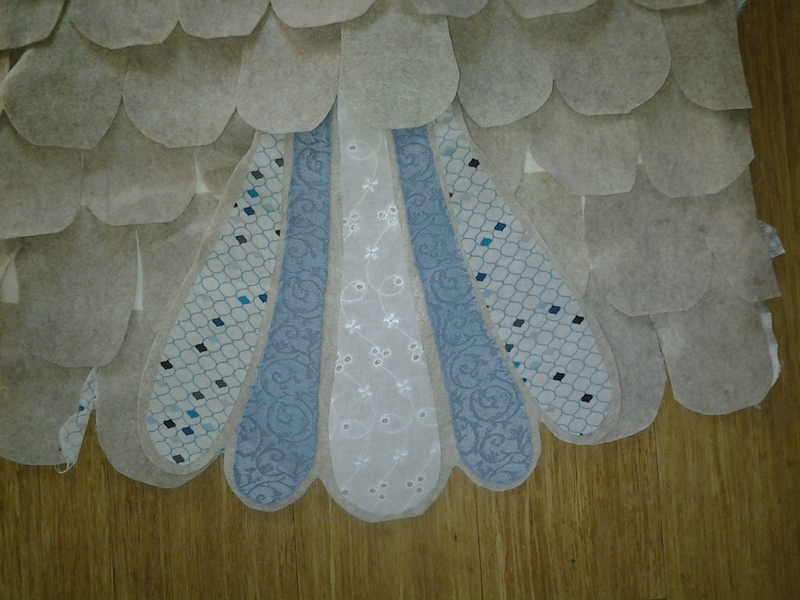 So we decided to add the ‘feathers’ to the back using one solid color of felt. 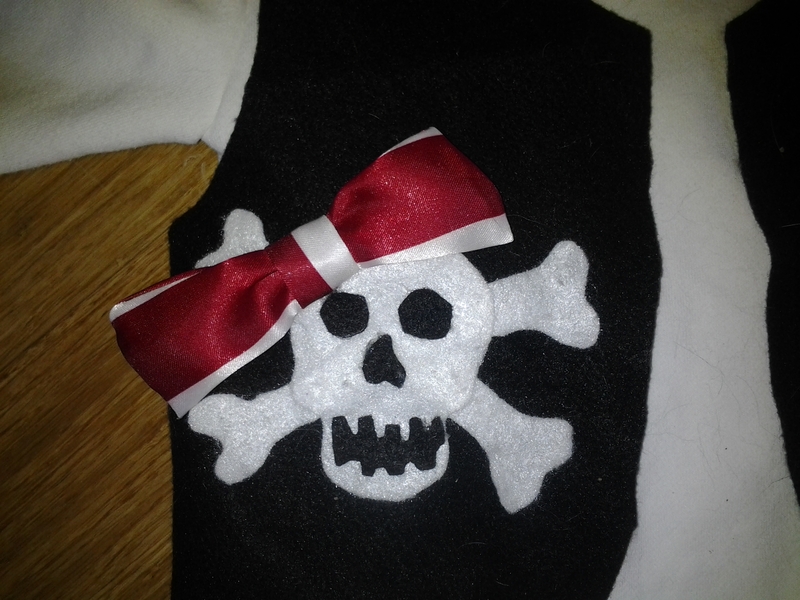 I also came up with a cute tail pattern and added iron-on fusing material to my fabric to add the colors to the felt tail. I found some fun feather hair clips at Jo-Ann Fabrics and my co-worker had a glamorous side pony tail accented with a few feathers. We were all set. 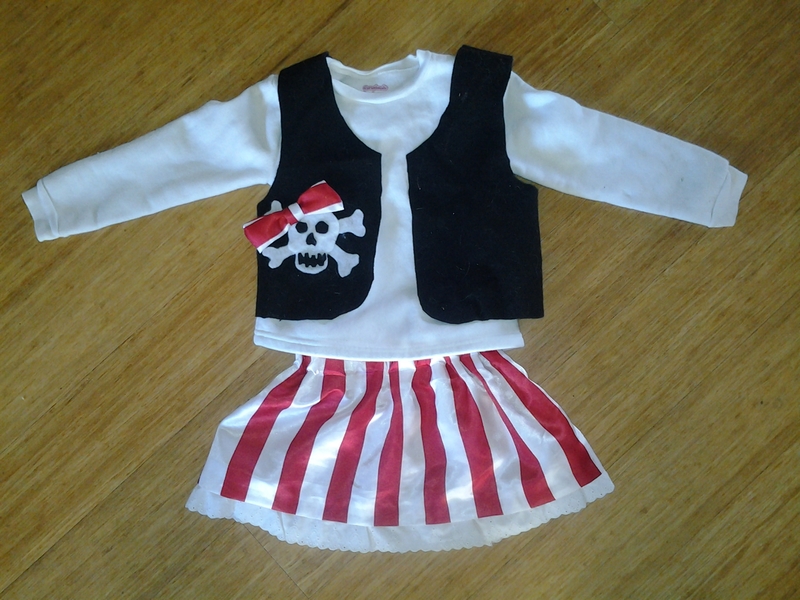 Fiona wore her Rapunzel dress again, from her birthday party, and I made a cute little pirate costume for Lexi which she just wore over a warm sweatshirt. 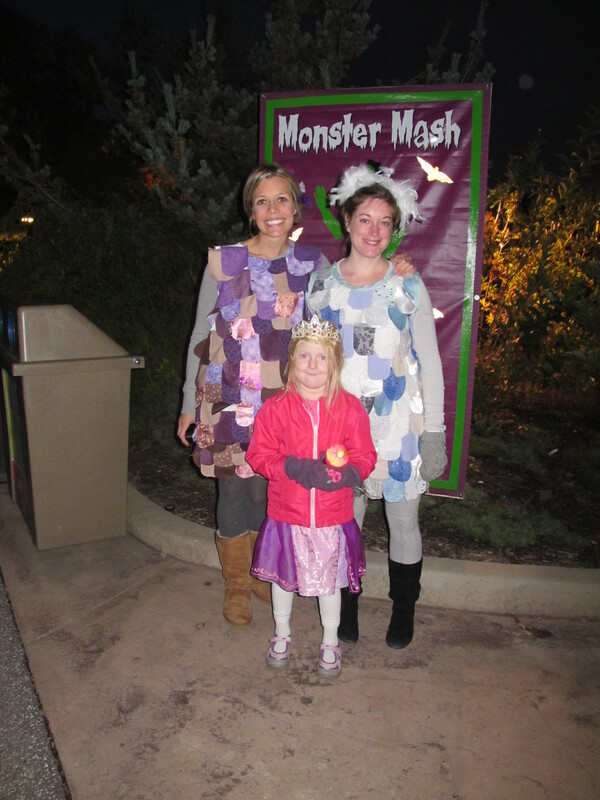 Boo at the Zoo was tons of fun, especially since it wasn’t super cold or rainy. We saw a magic show, pretty lights, the kids each got fun glowing things, we got to see a cool juggler (who coincidentally is also scheduled to do a show at our library in the early spring) and it was just kind of cool wandering around the zoo at night with kids in costumes all over. The only disappointing part of the whole evening was when we were heading into the animal petting barn and a woman looked at us and said, “Oh how cute, are you guys dressed up as quilts!” My co-worker and I were so disappointing and saddened that someone thought we looked like walking quilts instead of cute little owls. 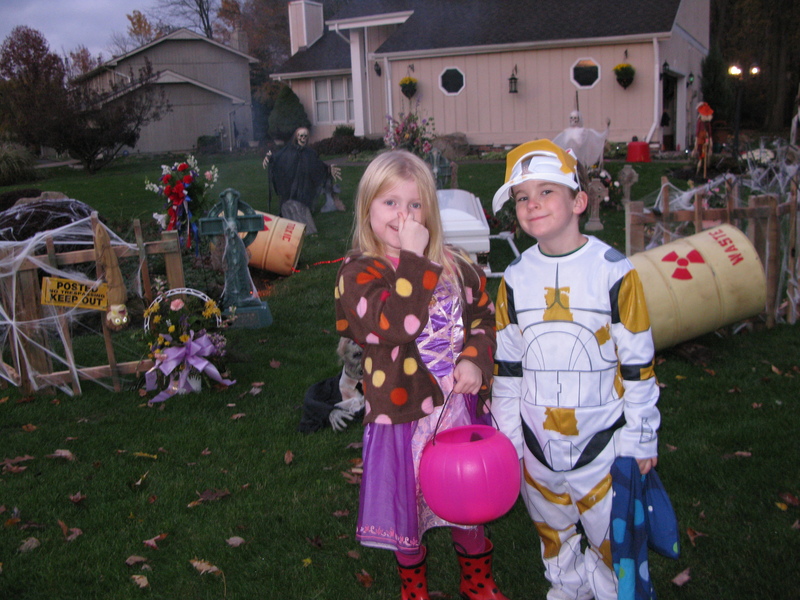 In fact neither one of us actually wound up wearing our costumes on Halloween, because we both felt kind of deflated about the whole thing by that point. 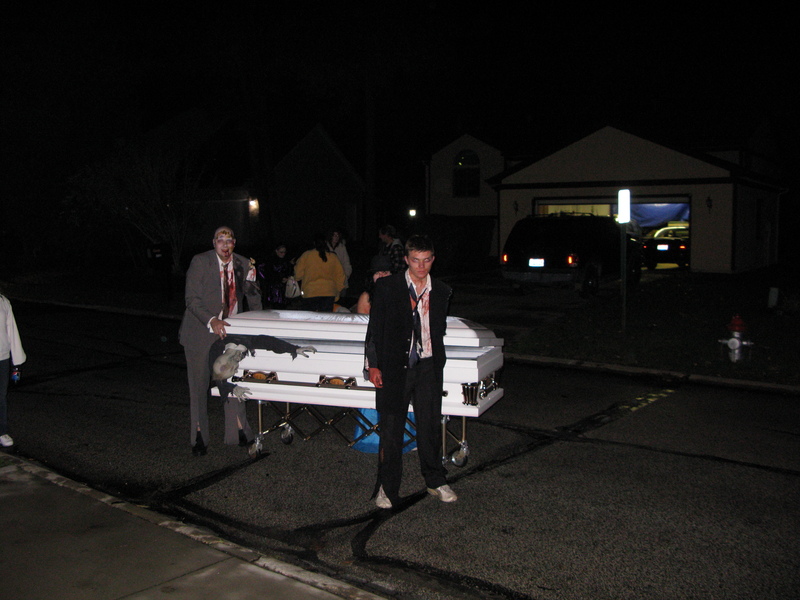 Trick or Treating is always a fantastic time in my neighborhood. 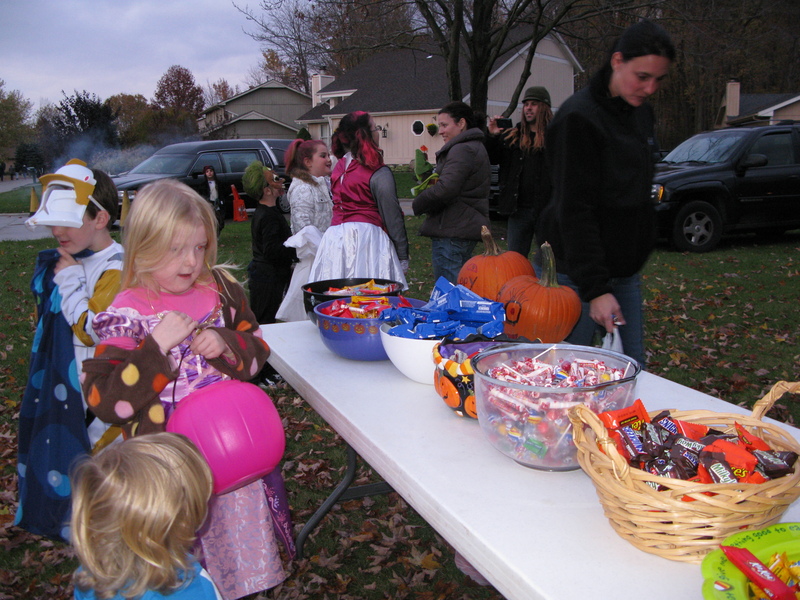 Everyone is out with fire pits, some houses give out full sized candy bars to the kids and jello shots for the parents. It’s such a festive occasion. Tons of great decorations, serious crowds of children roaming the streets. It’s nothing like our old neighborhood where people turned off all the lights and holed up in their houses. 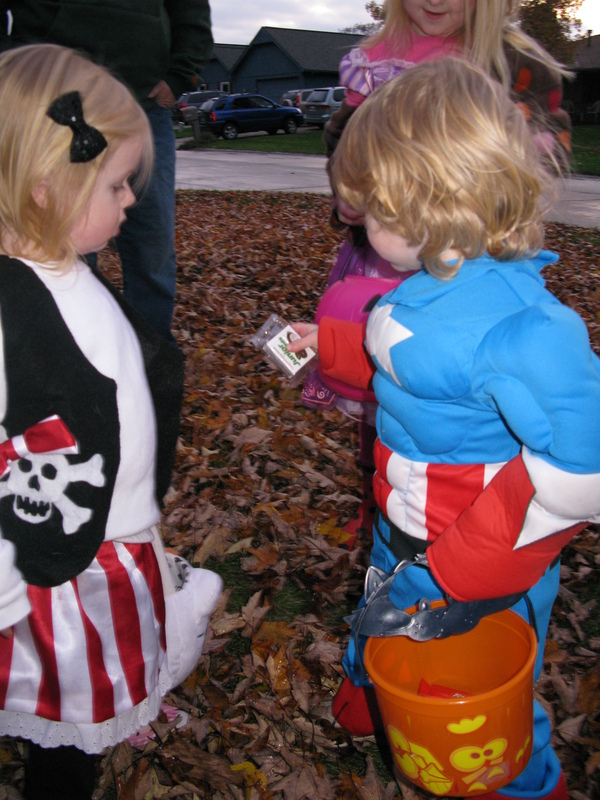 Fiona was lucky to get half a bucket of candy. 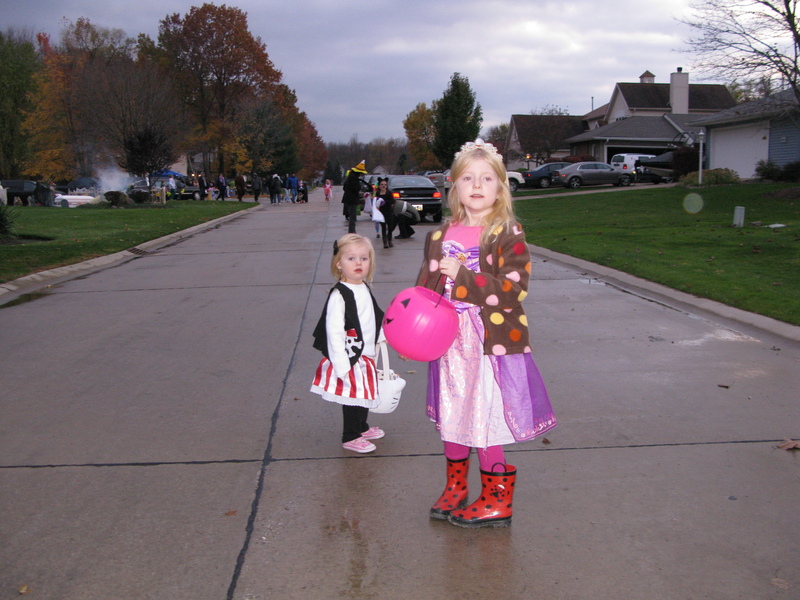 Here even after just going halfway around our block, both girls had filled their buckets and deposited their candy into a large bag that my husband or I carried throughout the night. 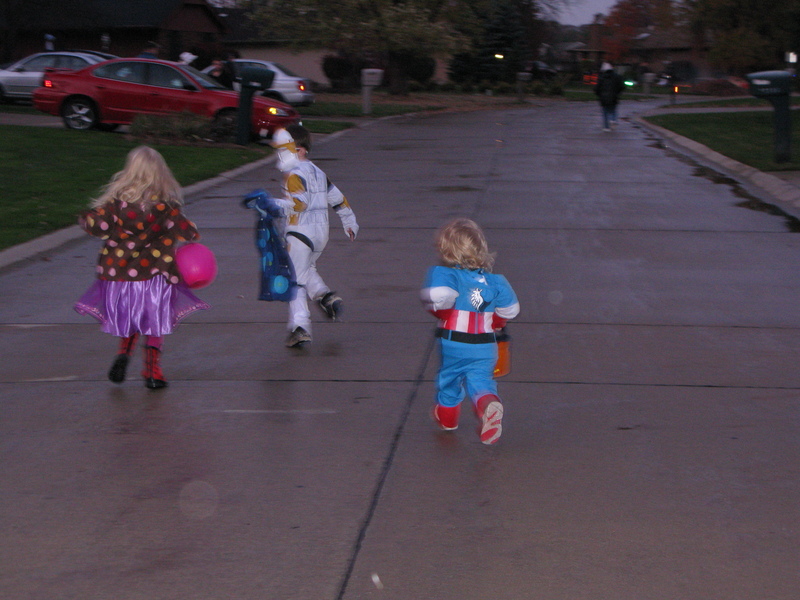 We met up with some friends from our street and the kids ran out into the night with much whooping and hollering and jumping. 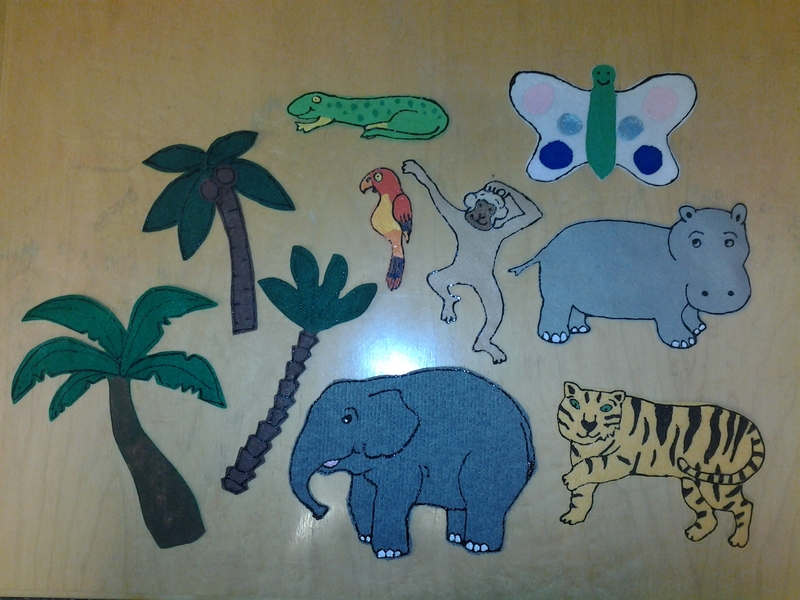 This week, our story time theme was Wild Animals. 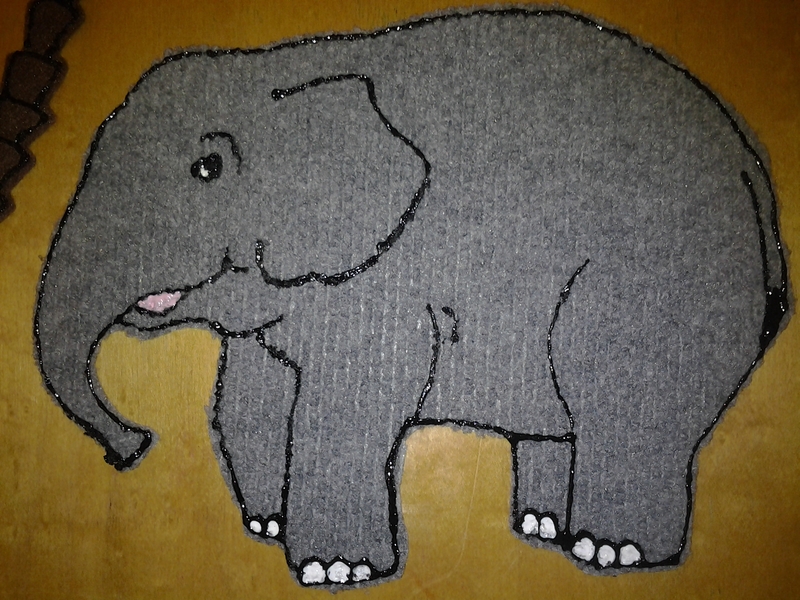 I love the felt I found to make the elephant and the Rhino. It was this pack of recycled felt at Micheals and the gray was a cool ridged material. Perfect for bumpy skinned animals! We put some animals together from an assortment of animal felt boards I had already made for this song. 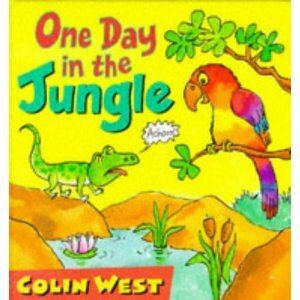 Later during storytime my felt board book was One Day in the Jungle by Colin West. It’s a chain of event stories that begins with a sneeze (as many good chain of even stories do!) that spreads from animal to animal until at the end the elephant gives a mighty sneeze and blows away the jungle. The kids had a great chuckle at this one. It was a cute story.